A review in 10 words (or thereabouts): Criminal Minds meets CSI in a fun and thrilling teen mystery series. What Cassie doesn't realize is that there's more at risk than a few unsolved homicides -- especially when she's sent to live with a group of teens whose gifts are as unusual as her own. Sarcastic, privileged Michael has a knack for reading emotions, which he uses to get inside Cassie's head -- and under her skin. Brooding Dean shares Cassie's gift for profiling, but keeps her at arm's length. Soon, it becomes clear that no one in the Naturals program is what they seem. And when a new killer strikes, danger looms closer than Cassie could ever have imagined. Caught in a lethal game of cat and mouse with a killer, the Naturals are going to have to use all of their gifts jus to survive. My first audiobook of the year and it was pretty darn good. Cassie is special. She has the ability to read people, to know at a glance their personality and behavior tendencies. Then one day the FBI shows up on her doorstep and offers her the opportunity to be trained by professionals, to help solve crimes and make a difference. 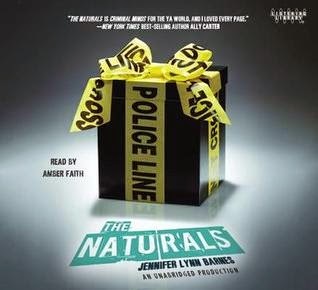 The Naturals, teens with the born ability to recognize emotions and liars, are in training until an unsolved case puts them right in the middle of the action. So I'm a sucker for shows like Criminal Minds and Dateline. I really like the mystery, the idea of hunting down clues and solving a case. I was an Encyclopedia Brown kind of kid, despite the fact that I never once successfully solved the mystery. But that's exactly what The Naturals felt like. A good, old-fashioned kind of mystery story. Barnes does an excellent job building suspense. She releases information slowly and shows the dark side of getting into a killer's mind. It would have to be exhausting having a natural ability to profile people. And oh so lonely. How could you ever really have friends? How would you trust people? How would anyone trust you if they thought you were always analyzing them? I'll definitely be checking out the rest in the series.